September has Single Skein September, October has Socktoberfest, November has NaKniSweMo, and December has holiday knitting, leaving the rest of the winter to languish without a knitting party. No longer! What is Vest-uary? Why, it’s a way to rescue the drabness of February from its own tired moods; a time to celebrate the undervalued little sister of the pullover; and it’s an expression of faith that the seasons will change and we will not always need to wear bulky, double-knit, alpaca coats and nightcaps to bed in order to be warm, for lo! spring will indeed come again…ahem, that last part might just be me. Vests, let me sing your praises. You give me warmth without having to knit sleeves. You are the knitted equivalent of a hug. You are a chance to show off my snappy shirts. You let me dig through my jewelry box and finally wear a necklace even though it is winter. 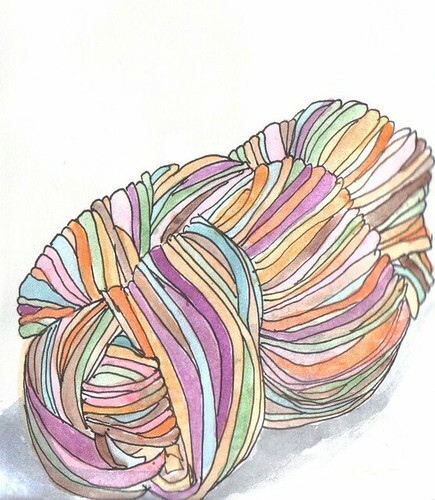 You are perfect for knitting up leftover balls of yarn. I love the one vest I’ve knit and covet more, more, more! They’re perfect to add that bit of snap to an outfit. They can go preppy to the office or bohemian to the coffee shop. They let us cold-blooded people wear our shirts or blouses for more than just 4 months each year. So I’m creating Vest-uary in the hopes that I will knit one, or possibly even two, vests to add warmth and a touch of fab-u-lous-ness to my wardrobe. Vest-uary is is simply a month to knit or crochet or sew vests and enjoy wearing them. It’s a no rules craft-along. There will be a Flickr Group to collect our photos. There will be a Ravelry Group for those who both Ravel and revel in vesty goodness. So, join me in thinking of layering, sorting through the stash for the right yarns, and celebrating the sleeveless. There will be fun had by all. And prizes. Fun and prizes. But, don’t you see, February has three parties for me! So clever already. But it does need more. Admit it. Then I saw the slipover. Just when I was trying to mosey on over to household knitting (rugs, pillows, etc) instead of garments. What a great idea. From the trenches of Christmas crafting, it’s hard to imagine having the time available to knit a vest. But just a few more weeks of work and I WILL have time to take up other projects, won’t I? I have so many vests in my ravelery queue, I don’t where to start. And I have that yarn that used to be a poncho. Vest – uary! What a great idea. Please keep us posted. This looks like lots of fun and I do want to make a ribwarmer! I recently finished the Back to school U neck vest (or in our case the not-back-to-school vest) and I love it. It adds just the right bit of warmth at this time of year. In case you haven’t heard of this vest and want to see a photo I posted about it here. It’s from the Fitted Knits book. I fear that if I look at the vest links that you posted I will be tempted to start another vest. hello. just found your blog and glad i did. i too have been thinking about vests recently. i made one for the hubby a few years back and i think i need one too. and my girls too. vest-uary! love it.